This sounds relatively straightforward, but just as you get started, out pop the Bad Guys. These eager lawyers at the Association of American Publishers, the Recording Industry Association of America, the Author’s Guild, the Motion Picture Association of America and their ilk are charged with thwarting you at every turn. Their jobs are to help their associations make money, which means that they don’t want anyone copying their materials and (heaven forbid) make it so anyone could get at any of it without paying for the privilege. As you’re trying not to fall prey to the wily and over-protective lawyers, there are some power-ups along the way that can offer protection. These power-ups come in the form of your own growing knowledge of landmark court cases in which the high courts have told those Bad Guys to back off. The recent HathiTrust case, for example, provides a useful (and expansive) definition of transformative use that will give many a digital humanist a new lease on life. ** The Google Books Settlement? Much of that was left kind of murky, but it is still a case that any digital humanist working with digitized text should know about. And if you’re interested in thumbnail images and deep linking, Perfect 10 is your case. Level one is both relatively straightforward and also utterly crucial. Is the work you want to use governed by a license agreement? As a hint, pretty much everything available digitally is licensed, and licenses trump copyright. Want to use that full-page scan of a Victorian-era plate in a book? Better make your own scan unless your use of the professional scan falls within the terms of their license agreement. Your own scan will be totally fine to do whatever you want with because the original is out of copyright. But the professional scan is almost certainly brought to you by a license agreement. If the work you want to use is licensed, the Use-Man game is over. Follow the license agreement and all will be well. 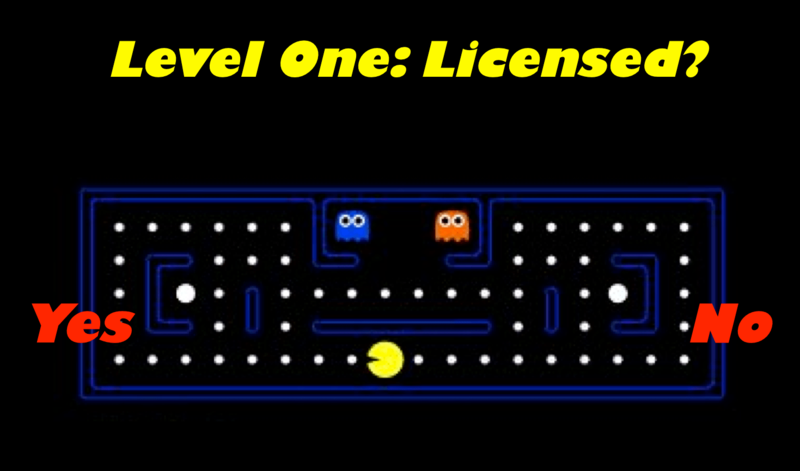 If the work you want to use is not licensed, continue on to Level Two! In level two there are two ways to win! Either you find that the work you want to use is in the Public Domain or you find that your intended use of the work falls under Fair Use. In either case you’re in the clear. You win! Note that Public Domain does NOT mean “generally available to the public.” It means that there are no copyright restrictions on the work. Was the amount of material taken appropriate to the purpose of the use? It’s all about context and appropriateness. Luckily for us, judging context and appropriateness is something that we all do all the time as scholars within our communities. So don’t be scared! And remember your fruity power-ups! 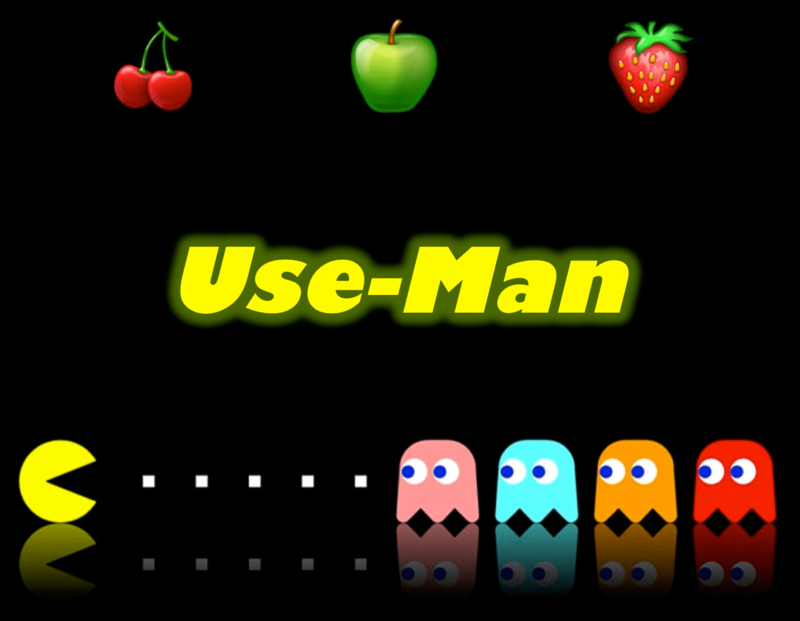 What happens if you don’t win the game of Use-Man? You can decide either to use different material for your work, or to ask for permission from the copyright holder. 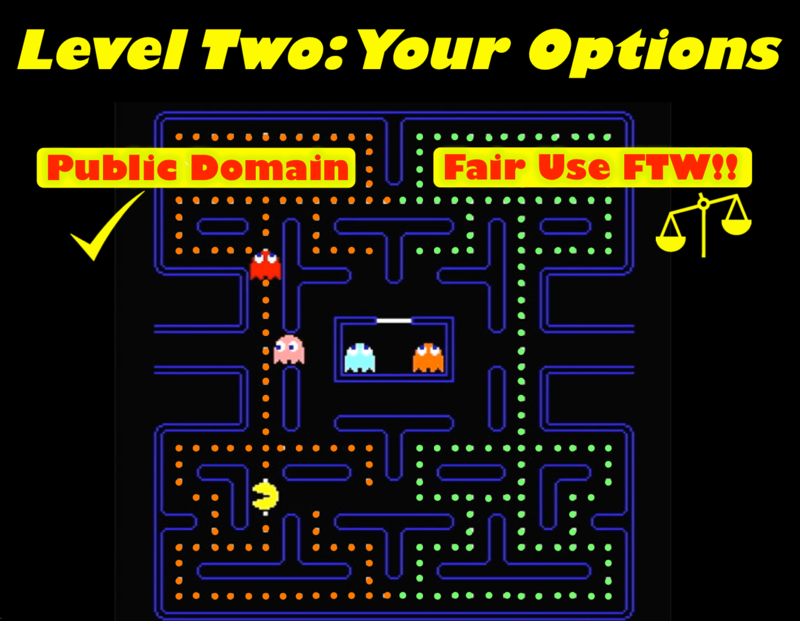 But Fair Use was built for exactly the kind of work that we do in our teaching and research, so know your rights, know that they are written into the law itself,*** and keep an eye out for power-ups! Finally, you may have noticed that I never once said “as long as you cite your sources.” That’s because none of this has anything to do with the ethics and rhetoric of attribution. Copyright is about the legality of use; citation is about the ethical and rhetorical culture of use. * And yes, I am relying heavily on the idea of transformative use here. No actual arcade game was harmed in the making of this talk. ** Digital archives of text meant to be searched are, apparently, fundamentally different from individual books meant to be read. Aufderheide, Patricia, and Peter Jaszi. 2011. Reclaiming Fair Use: How to Put Balance Back in Copyright. Chicago: University of Chicago Press. Use-Man, very nicely done translation. Makes me look up the legal situation again.